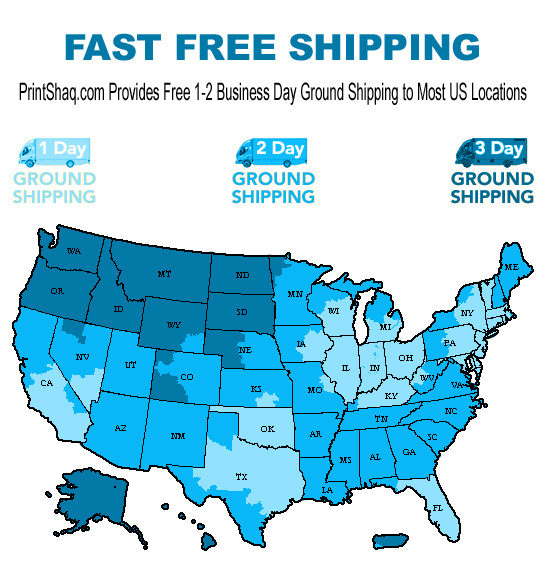 *** Certain items are excluded from the above shipping map. Below is a list of those items. Any Diecut, Foil Stamping, Embossing, Spot Uv, Raised Spot Uv, Plastic, Lenticular, 32 Point Mounted Cards, Letterpres & Jobs w/ 1/8 inch Round Corners. We do our best to keep this list updated and complete but we do make mistakes from time to time. So if you are unsure if an item should be on this list and you want to be safe. Then we recomend you contact us via email or phone, to be on the safe side.